Infrared rays from eight gemstones - providing the body with a soothing warm feeling. The BioBelt™ consists of 11 layers. The Richway Fuji BioBelts healing crystals are amethyst, tourmaline, green jade, crystal, citrine, topaz, tiger's eye, and elvan. They heat up to 158 degrees and provide relaxing healing warmth. The BioBelt is the smallest size BioMat product. Gemstones have been used for their therapeutic effects for thousands of years. The use of gemstones is not a New Age healing method; far from it. Documents have been found in Asia and the Middle East describing their medicinal uses. With its use steeped in tradition, only in recent times has science recognized the power that these stones can harness. Crystals have been associated with the generation, transmission and storage of energy. Our watches, computers, lasers and televisions all use them. We have carefully selected the most effective semi-precious stones to enhance the power of the Biobelt™. The far infrared energy generated from these stones will gently penetrate your body providing warmth and comfort. The BioBelt™ produces far infrared rays, which are invisible waves of heat that have the ability to permeate deep into the body. These rays gently raise the surface temperature of the body, which is believed to enhance body functions on multiple levels. There have been numerous studies identifying the benefits of far infrared. A study published in the Journal of the American College of Cardiology has found far infrared sauna therapy improves cardiac function and clinical symptoms in those with Chronic Heart Failure. The authors concluded that repeated treatment improved vascular endothelial function. Note: these studies apply to infrared energy, and were not performed using the BioBelt™. A randomized, double-blind, placebo-controlled trial was conducted at Rothbart Pain Management Clinic in Ontario to test the effectiveness of pain relief obtained by applying infrared energy to the lower backs of patients with chronic, intractable low back pain. The study demonstrated a 50% reduction in chronic back pain over six weeks. 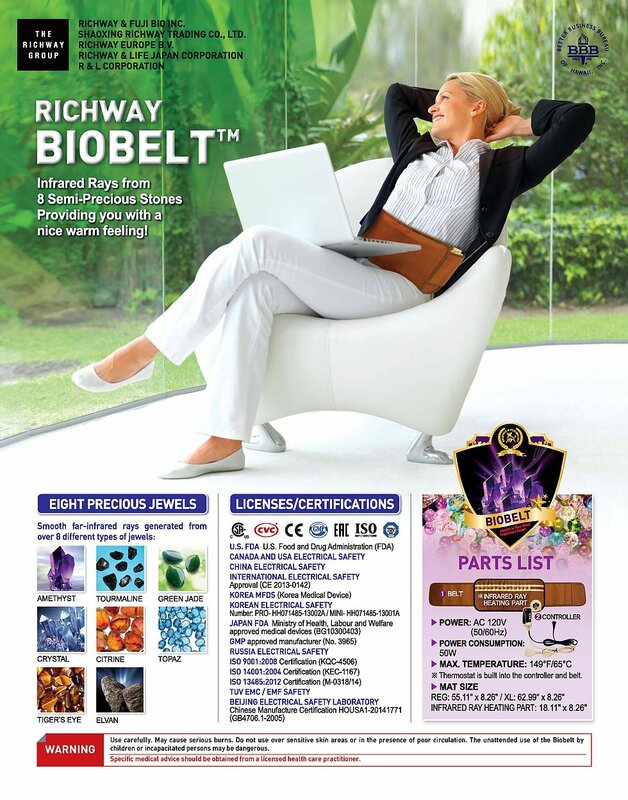 When the BioBelt™ is turned on, one will feel the gentle heat of the far infrared rays. This heat helps to relieve the body of its aches and pains. - Dilating the blood vessels of the muscles. This process increases the flow of oxygen and nutrients to the muscles, helping to heal the damaged tissue. - Stimulating the sensory receptors in the skin, thereby decreasing the transmissions signals of pain to the brain and partially relieving the discomfort. - Softening the muscles and tissues, thereby decreasing the stiffness and increasing the comfort. Dimensions of Jewel Portion Only - Heated Portion 18.11" x 8.26"
Regular Size Dimensions 55.11" x 5"
Extra Large (XL) Size Dimensions 62.99" x 5"